Kenny Cherry, aka Kenny Clutch, was a 27 year old rapper from Oakland who was killed early Thursday in Las Vegas on the stripÂ near Ceasers Palace whenÂ the silver-grey Mazerati he was driving was riddled with bullets byÂ occupants of a black Range Rover, causing a multi-car collision killing two others, NY Daily News reports. Authorities said Cherry and the driver of theÂ Range RoverÂ may have been involved in a verbal altercationÂ at the Aria resort hotel – and had left there – and were heading north on Las Vegas Boulevard at 4:20 a.m when occupants of the Range Rover opened fire on Cherry’s Maserati. Cherry’s Mazerati was struck several times,Â and careenedÂ into the intersection at Flamingo Road,Â hitting a Yellow Cab, which exploded, killing the driver and a passenger. 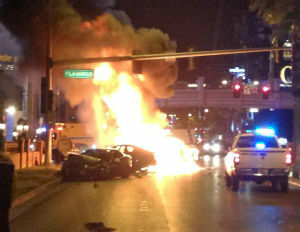 Four other vehicles in the intersection were also involved in the crash and explosion, and at least six others were injured. A passenger in Clutch’s car was shot, but survived. Kenny Clutch died at the hospital. Police are still searching for theÂ shooter and Range Rover. “This is like something out of a movie. Like ‘Die Hard’ or something,â€ MarkÂ Thompson, who was visiting from Manchester, England, with his wife, told the NY Daily News.